Recent review from the Star Bulletin of Benny Chong's first solo uke CD. "Benny Chong has been known for more than 40 years as the guitarist who helped make Don Ho & the Aliis one of the biggest acts in contemporary Hawaiian music. It has only been in the last few years that Chong has stepped forward as an ukulele virtuoso -- although his solo recordings have only been on a compilation album. This is his long-awaited debut as a solo artist. Chong proves worth the wait." If you're on the Left Coast this weekend, check out Keep Santa Cruz Weird at the Rio Theatre on Saturday, October 29th. "...support your local deviant, and indulge your own flair for the denial of normalcy by attending this showcase of local weirdness." The Ukeaholics and Oliver Brown are on the bill, too! Sounds like a most excellent time! For info, contact Andy Andrews. Here's yet another wonderful online source of vintage sheet music, much of it with ukulele arrangements (chords). A nice feature of the IU site is that you can elect to search for only digitized records, thus saving you from having to scroll through pages of returned records without scanned sheet music images. "The Uke Out at the Knock Out was great last night. First we ate accross the street at a little Japanese restaurant. The Knock Out turned out to not be a concert, but just a bar. It was a little crowded and hot in there, and they didn’t start until late, but the music was great. The first guy, Cracker Jack Salteen, sounded a little awkward, but at least he acknowledged it. The best group had to be the Paper Dolls who went next. Those girls could sing, and definately took the attention of the crowd. They threw in some Prince and Boy George and it was great. Dimestore Dandy was good, he could sing and his songs were great. He even had a kazoo inside of a tin can around his neck. Tippy Canoe and the Paddlemen were great too. The end was great, as the Paper Dolls joined the Paddlemen onstage as the Sweaters, and they did some great doowop numbers. Check out the photo album." Tikimeister Otto von Stroheim pointed me to this photo of silent screen siren Renee Adoree, shown here with Ramon Novarro in a still from what I guess is probably from "The Pagan." Note the authentic polynesian beret Renee sports while Ramon restrains his curly locks with one of Renee's garters (or a headband from Ben-Hur--I can't tell which). Apparently Ramon was just about to offer Renee a bite of his sugar cane when director W. S. "One Take Woody" Van Dyke yelled "cut!" "It's time to bring the ukulele back; size does not always count"
A review of last weekend's festival in Nova Scotia:"
"It's not easy to love the ukulele. The instrument has a bad reputation, a tricky name to spell and very little street cred. To make matters worse, record-breaking rains made the First International Ukulele Ceilidh in Liverpool last weekend nearly inaccessible to anyone travelling from Halifax." 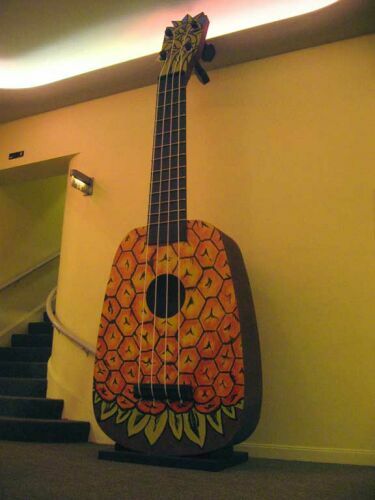 Mark posted this over on BoingBoing, and it's one of the most imaginative uke ideas we've come across recently. 'Japanese artist, Nabuaki Date, make ukuleles out of parts of soon to be demolished houses and buildings. The ukulele is then given to the owner of the house as a physical and acoustic embodiment of its memories and history. "While I have seen one other tone wood hand crafted toilet paper holder in my ukulele travels, rosewood or mahogany, at C.F. Martin in Nazareth, this is the first koa one I've seen. "A detective in the Coronado Police Department has asked me to lend my voice, as it were, to the investigation regarding the disappearance of several thousand dollars at the San Diego Ukulele Festival. This money was destined to buy ukuleles for troops serving in Afghanistan and Iraq. The police also asked me to make it clear that Cathy Michalski was the direct victim of this crime. She is not a suspect. Whoever stole this money is believed to have come to the festival as a ukulele player. If you or anyone you know has information regarding the disappearance of this money, please contact the Coronado Police at 619-522-7347. Right now, we have requests for far more ukes than we have money. This is not about supporting the war. It is about the gift of ukulele to young folks in harm’s way on a daily basis. Anita Coyoli-Cullen is in charge of Ukes for Troops. She is currently using www.ukefortroops.com as the web site, while I am in the process of transferring ukesfortroops.org and ukesfortroops.net to her name. She is in the process of receiving 501 3c not-for-profit status. Shirley Orlando does the fulfillment. Neither of these fine ladies makes a penny for their efforts. If you want to donate, every $20 buys a uke that is sent over there (songbook and postage incl). Every cent raised goes for getting ukes in the hands of the troops who want them. There are no administrative costs taken from the funds raised. All donations made now are tax deductible through Operation Home Front. Checks should be made payable to Ukes for Troops and sent to the address on www.ukesfortroops.com. Please, if you know anything at all about the missing money, contact the police at the above number. If you actually know the individual who stole it, get that person to return it anonymously or through an intermediary. The return of the money would likely end the matter now, and it would let us fulfill our promise to some young people who want to play ukulele."